This is a review of the Frye Harness 12R boots. I heard that these boots run narrow so I decided to take the plunge and buy them when I saw Amazon was having a 30% off shoe sale (might still be going on at the time this is published - try code 30SHOES1 or 30SHOES2). Frye boots are by no means inexpensive, but with the 30% discount on these shoes, plus the remainder of an Amazon gift card, I was able to get them for only $117 which made them much more attractive to me. The color below is Chocolate Vintage Leather, and I picked it because I thought the darker brown could go easily with blacks and other browns, and I loved the vintage/worn look. The shoe comes in many colors, including several that don't look worn like this. The shaft circumference is said to be 13.5" around and I found that measurement true to size. The shoes themselves run about a half size large, so I took the 6.5 instead of my usual 7 and they fit great. Plenty of room in the toe area. With a thick sock they fit snug but reviews online say they stretch out with wear. Given my warm climate, I doubt I'l be wearing the shoes with thick socks any time soon. I finally got around to measuring my calves and they are 12" exactly. I've seen ladies with even smaller ones but mine are clearly below average in circumference. Without pants on, these boots are too large. But I'm not really a "boot with skirt/dress" kind of person anyway. With super skinny jegging type pants they still look a little large (I'd still wear them though), but with "straight leg" pants, like the ones I'm wearing above, I love the look. There is just a bit of room but not enough to look like I'm swimming in the boots. And if I ever desire to wear the boots with a skirt or dress I could see thick boot socks fixing the problem. I never said I was the most practical dresser, so I don't see a problem with weather warm enough to wear dresses yet wearing boots with thick socks, lol. As for construction, there is no question these shoes are impeccably made. The boots are sturdy and heavy, and are made from strong, thick leather. As for comfort, my right shoe was comfortable straight out of the box. The harness portion on the left shoe, however, is rubbing into my ankle for some reason. I tried adding my heel insert (to attempt to raise my ankle above the harness portion to prevent chaffing) but it wasn't high enough. I also added a thick ski sock and bunched it down to try to prevent the chaffing but that also wasn't enough. I remember my Steve Madden boots hurting like this for a few wears before they became super comfortable so I'm not giving up yet. If worse comes to worst, I will take them to the cobbler and see if anything can be done on the left shoe. Overall, I'm very happy with my purchase and would recommend these as a slimmer calf alternative. They are not my holy grail knee high boots, however, and I'm still looking for a more classic pair of black knee high riding boots. I'm considering the Michael Kors Arley Stretch Boot as I tried it on at Nordstrom and it's one of the slimmest I've ever seen, without being skin tight at the stretch part. I'm also considering the regular Arley Boot (without stretch) as it has a 13" circumference and no stretch (but haven't tried it on yet). Do you own any Frye boots? Please share your experiences (whether about calf circumference, quality, or anything else) in the comments! Dear god, I love my frye boots. I have a different style, it's called the Veronica Slouch. and i love them more than anything! i've had them since I was 18 and they are still in amazing condition, they've walked for miles upon miles in NYC, and then came with me to FL, where they don't walk nearly as much. And they are my official plane shoes. The point here is, they look amazing, and while they took a little breaking in to get comfortable, they are some of the best shoes I own, and easily one of the best 300 I ever spent. I love those suckers! 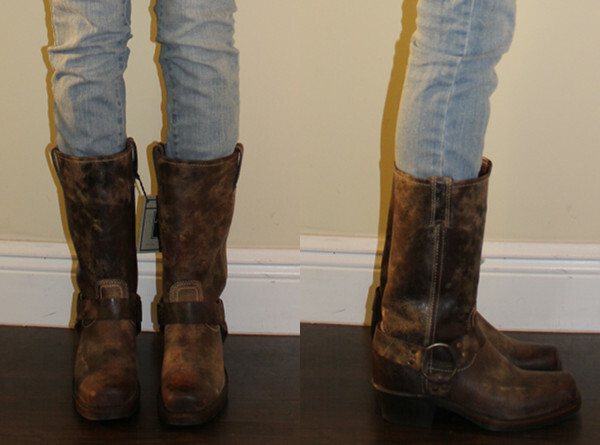 Also, my dad is a huge frye boot fanatic, but he likes the engineer styles. He also swears by them. I did hear the Veronica Slouch run pretty slim but was turned off by the "slouch" in the name because I don't want a sagging/slouchy boot. The boots look great in your photo by the way! these fryes are the epitome of cool.